AROUND A DOZEN PEOPLE are walking the long, straight footway through Hyde Park where the lines of overaching native figs form a vegetative tunnel. They pass Francois Sicard’s Archibald Fountain, opened in 1932 with its classical, sculptured figures and animals that spray water skywards. Exiting the park, they enter Macquarie Street and make their way to an old sandstone building with a long verandah. Here, they are to hand over the state’s first Declaration on Food. The delegation includes visiting food advocate, Jeanette Longfield MBE, who is co-ordinator of the UK’s national food education and advocacy organisation, Sustain. A brief ritual follows during which the Sydney Food Fairness Alliances’ (SFFA) Catriona Macmillan hands the Declaration to state parliamentarians including Ian Cohen, MLA (The Greens) and Paul Pearce MP (Labor). ABC radio records the proceedings and speaks to Jeanette Longfield, who was a keynote speaker at the SFFA’s Food Summit, of which production of the Declaration was the last day’s activity. The Declaration will be mentioned in Parliament and entered into Hansard. Contained in its pages are ideas for a sustainable food supply and for equitable access to food, among other topics. Hopefully, it will also form the basis for an ongoing program by the SFFA and others for a regional food future that is, in part, based on access to local, fresh food produced by city fringe farmers on land zoned agricultural in pepetuity, who receive a good financial return for their product and who make use of sustainable farming methods. The ceremony marks the culmination of the Sydney Food Fairness Alliances’ (SFFA) Hungry For Change, a Food Summit itself the culmination of a series of Summit lead-up events that have taken place over the previous months. Those lead-up eventshad packed the Sydney Customs House (the inner-urban, Inner West and Eastern Suburbs event) and attracted people to regional gatherings in the Blue Mountains, Macarthur region, Illawarra and Central Coast. 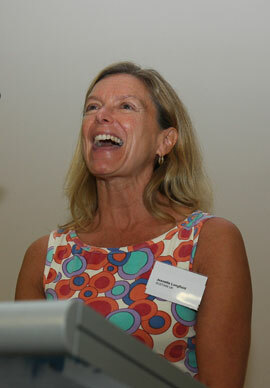 Sustain’s Jeanete Longfield’s participation in Hungry For Change was entertaining and inspiring. The fact that Jeanette Longfield was awarded an MBE for services to food policy in the 2007 New Years Honors List signifies that food and the growing number of issues around its production, supply and consumption is a topic whose time has well and truly come. Sustain involves itself in similar work to the SFFA but has been in existence much longer and its program is more ambitious. It’s probably no secret that some in the SFFA would like their organisation to eventually acquire the same status that Sustain enjoys. A petite woman whose blonde hair shows off a newly acquired Australian suntan, on the first day of the Summit Jeanette had stood on the stage in the auditorium at the Teachers’ Federation Convention Centre dressed in a bright floral frock. Hers was a light, animated and sometimes humourous presentation during which she told the audience that the adoption of a food policy does not always lead to action by government. Listing cities that already have food policies (London, Vancouver, Toronto), she described London’s food strategy as “really good” and told the audience that London’s previous lord mayor, Ken Livingstone, had also been “really good” and the new Lord Mayor of London had surprised many with his interest in a viable food system. She said that Sydney is fortunate to have a lord mayor like Clover Moore who has an interest in simulating a sustainable food supply for the city. Jeanette mentioned an innovative, City of London project to expand the area of the City devoted to food production — a plan to identify 2012 new community food growing spaces by 2012. Jeanette said a high level political support is crucial in advocating a more safe and secure food system and that support from a mayor or deputy mayor was advantageous. 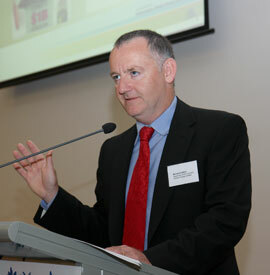 The Sydney Food Fairness Alliance’s Food Summit was opened by the Lord Mayor of Sydney, Clover Moore. Opening the Hungry For Change Food Summit, Sydney’s Lord Mayor, Clover Moore (Independent), started by pointing out facts about Sydney’s food system. “Eighty percent of NSW’s food comes form the Sydney Basin. The region is 30 percent more productive that farmland in the rest of NSW. The Sydney Basin has a more reliable water supply than regions west of the [Great Dividing] Range and it is accessible to the city, producing food that is local and seasonal”. Clover’s city government has moved on food. Last year, the City of Sydney started a grower’s market in the centre of the city adjacent to Hyde Park to bring some of this local food to city workers. The City is also expanding the number of community gardens and has employed a Community Gardening and Volunteer Coordinator. Clover Moore went on to criticise the loss or city fringe farmland to urban development, the developers’ lobby and its influence on state government. 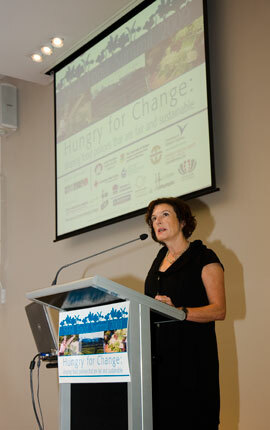 Tying the intellectual threads of Hungry For Change together was Lyndey Milan, a food writer and broadcaster. Part of her role as MC was to introduce the SFFA’s President, Lynne Saville. Lynn was earlier involved in the creation of the Hawkesbury Food System and serves as a councillor on Willoughby Council. 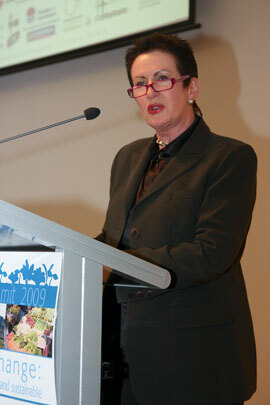 Food journalist Joanna Savill, manager of the Sydney International Food Festival, addresses the Summit. Lynn continued the themes introduced by Clover Moore, stressing the importance of the city fringe farmland to the security of the urban food supply and the industry it supports, and the need for a policy on food that underwrites sustainable production, food affordability and access by those who most need nourishing foods. “By 2050, we will need to produce twice the amount of food we presently produce and on the same amount of land to feed an expected global population of nine billion”, she tells the audience. “Yet, 52 percent of Sydney’s vegetable farms are to be developed under the state government’s Metropolitan Strategy which will bring urban growth as large as the city of Canberra in the region. “Climate change is a threat to our food supply and agriculture in Australia is respected to decline in productivity by up to 27 percent over the next 75 years. At the same time, greenhouse gas emissions from agriculture account for something like 24 percent of all emissions when non-farm sources coming from food processing and transport are included. 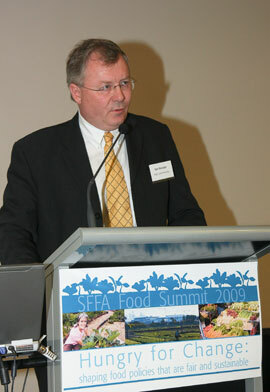 “The role of the SFFA is to put food security on the agenda. All Australian governments need a food policy and by 2030 we need to provide Sydney’s projected six million people with access to affordable, healthy food produced by a sustainable agriculture”. 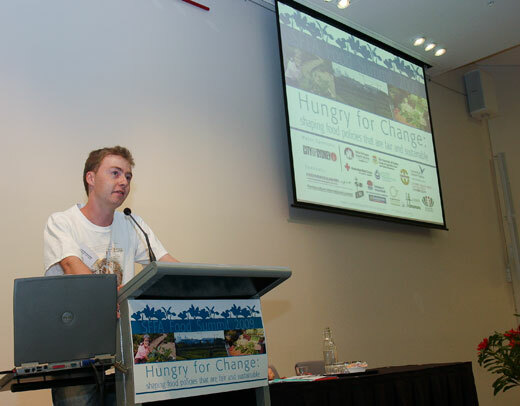 Climate change and its likely impact on our food systems was a theme picked up on by Josh Wyndham-Kidd, the speaker from the Australian Youth Climate Coalition, who is soon to leave for the climate talks in Copenhagen. A little less nuanced in his criticism of government than other speakers, Josh said that the federal government’s policies “are lacking… they won’t reward farmers for carbon sequestration and, when it comes to climate change, agriculture and food, the government has no clothes. “We are talking about the food my generation will live off”. Josh Wyndham-Kidd, the speaker from the Australian Youth Climate Coalition. The NSW Department of Environment, Climate Change and Waters’ Bernard Carlon described how much of our food ends up in landfill. Formally dressed in dark suit and tie, the NSW Department of Environment, Climate Change and Waters’ (DECC&W)Bernard Carlon described how much of our food ends up in landfill. “A total of 1,100,000 tonnes of food is lost to waste a year in NSW. Around 38 percent of household food, by weight, is wasted. That’s 800,000 tonnes a year, 315kg per household per year going into landfill. And that excludes food wastes that are composted. “An additional 300,000 tonnes a year of food waste comes from the commercial food sector of which approximately 76 percent is lost during food processing. That excludes post-consumption waste from restaurants. “In landfill, of course, food wastes are converted into methane, and methane is a greenhouse gas. It is estimated that food accounts for something like 23 percent of Australia’s greenhouse gas emissions”. Bernard did not have encouraging news on household composting. “Composting is decreasing in NSW. It has declined from 58 percent in 2000 to 38 percent in 2009. Now, there are more people who have never composted. This is attributable to urban consolidation and the lack of motivation to compost in multi-unit dwellings”. being tempted by food retailers’ specials. The Department has taken the initiative to allocate a total of $7.7 million in funding to regional food projects such as those of Wollongong Council and the Northern Rivers councils of North Coast NSW. Propelling food wastes as an issue for our food system will be a DECC&W website devoted to the topic that will come online in the new year. Ed Biel is a Sydney region, urban fringe commercial farmer whose address focused on a number of themes coming from a farming perspective. Sydney urban fringe foodland farmer, Ed Biel. “In a city of 4.5 million there is competition for water, and water is needed for farming too. The reliability of the water supply in the Sydney Basin is greater than it is in the Murray-Darling Basin”. The anticipated greater reliability of water in the Sydney Basin during a period of climate change, compared to regions west of the Great divide, was a topic that other speakers raised in advocating saner farmland policies for the Sydney region foodlands. fragmentation among farmers, especially along the lines of farmer ethnicity, is another limiting factor and response to farming issues due to this is lacking. Finally, Ed raises the issue of how city eaters are to identify Sydney Basin produce — there is no branding such as an identifying label or logo for the city fringe farm product. Developing one would increase the value of the local product, says Ed, and attract a premium on local produce. A ‘brand local’ would bring market power, he tells the audience, and it should be recognised by the supermarkets. In a breakout session at the Hungry For Change Food Summit, the University of Western Sydney’s Dr Francis Parker, a researcher and an authority on Sydney’s urban fringe foodlands, returned to the ethnicity of the region’s farmers previously mentioned by Ed Beale. the number of market gardens supplying the city is in decline, having shrunk from around 2000 only a short time ago to around a little over 1000 today. The popular idea that immigrant farmers come from peasant backgrounds is a misconception. Many do not have a rural background and some are professionals, says Francis, but they lack a capacity with English. Commonly, they start by leasing farmland, working long hours and eventually buy the land, mainly by borrowing from friends rather than the banks. Francis says it is true that there is fragmentation in the ethnic farming demographic. 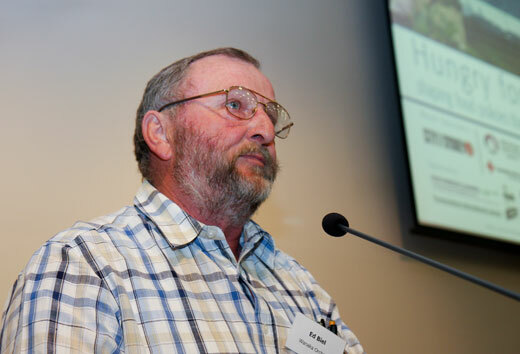 Planner and urban fringe farming advocate, Ian Sinclair. Ian Sinclair is a planner and planning educator specialising in the rural-urban fringe. A neat man in suit and tie, his presentation was so packed with information that it must have been quite a challenge getting through it in the time he was allocated. Ian started off reiterating the food security and economic value of Sydney’s urban fringe farmers. the presence of a substantial turf and cut flower industry. All of this is worth around $1 billion a year. As for climate change altering the rainfall pattern: “We have water in the Sydney Basin”, says Ian, emphasising the likelihood that the region will retain significant rain as other parts of the state become drier. This possibility alone makes retention of the Sydney Basin farming industry more than just a good idea. “Rural residential development displaces agriculture”, says Ian in reference to housing lots of 2ha or more on the urban fringe where the land is not used for food production or other agricultural development. Around 78 percent of western Sydney landuse is now rural residential and, as well as creating more urban sprawl, rural residential impacts the environment. “Recreational lawn mowing”, says Ian, is one of the fringe suburbanites favourite activities, yet it produces no useful product from the rich farmland those people occupy. Urban development of once-were-farms on the urban fringe also brings suburbanites into conflict with the remaining farms. Seeking a ‘rural’ lifestyle, these new fringedwellers move to the urban fringe foodlands then complain about farming activities and the noise, night activity and odour that is part of farming. This gives rise to what Ian calls complainant CAVE people: Citizens Against Virtually Everything. What’s needed, according to Ian, is a rural landuse study to identify prime and marginal agricultural lands and to zone landuse accordingly. Ian’s long experience as a planner in urban fringe development, including periods with local government, gives substantial credibility to his proposal that a ‘cluster subdivision’ model be adopted, where subdivisions are surrounded by agricultural landuse. This sounds very much like the idea proposed by the UNSW’s Dr Ted Trainer in the 1990s. When Ted proposed it, the inspiration was less conserving urban fringe farmland as an agriculturally productive landscape and more the search for an ecologically viable way to live. Ted is an educator-come-social-philosopher-come-visionary, however his writings have lacked the ‘how-to’ element that Ian Sinclair has clear ideas on. Ian also spoke of land being held by land trusts to prevent subdivision, and that developers be required to set aside land in new developments for community food gardens. In New York, some of the urban land occupied by the city’s community food gardens is held in land trusts and the model has proven viable as a means of retaining land for specific uses. Advocates of sustainable urban fringe farming and sustainable urban development need to “find an angle and press it”, he said. Flinders University School of Medicine’s John Coveney raised the idea of food democracy and said that healthy food is unaffordable to many. 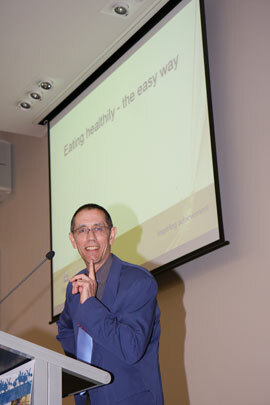 John Coveney has a public health and nutrition background and came to Hungry For Change from South Australia’s Flinders University School of Medicine. An innovative thinker, he raised the idea of “food democracy”, a term that reframes the commonly-used ‘food security’ as the right to safe, nutritious food while producing a fair economic return to growers. Healthy food, John said, is unaffordable to many. Whereas most people commonly spend around 12 percent of their income on food, those less affluent spend around 30 percent. Food advocates should “celebrate and record small successes”, says John. He recommends the Action Learning methodology as a basis for food advocacy. This is envisioned as a loop of action consisting of: plan > do > check > act. Although Jeanette Longfield said she has a hesitancy about forming partnerships, the experience of Nick Rose in creating the Coffs Coast Local Food Futures Alliance, an equivalent organisation to SFFA, has turned out differently. Established in 2008, the Alliance is made up of Coffs Harbour Council, North Coast Area Health Service, Landcare, CROPO (an organic producers’ agency), the Bellingen Local Food Network and local citizens. This, according to Nick, forms a foundation for joint work to address food rights and access, sustainable farming practices and the development of a local food economy. the establishment of two model community gardens (the Bellingen Community Garden Association is assisting this objective and the author, representing the Australian City Farms & Community Gardens Network, is to address Coffs Harbour council and citizens in early 2010). The region is likely to have its own community supported agriculture initiative in the new year, following the visit by Food Connect Brisbane’s Robert Pekin earlier in the year. An ‘Eden at Home’ home food growing course in association with TAFE and the local community college and the establishment of a farm gate trail are on the agenda. The educational value of the ‘permablitz’ model of mutual assistance of home food garden development is also of interest to the Alliance. Good ideas are not the property of the Coffs coast folk alone. They are also gestating in the Blue Mountains, less than 100km west of Sydney. There, says local food initiative advocate John McNiell, people have formed local food and seed saving groups (through which vegetable, herb and other seeds are collected, processed and exchanged), a food swap has started to operate as a means of exchanging surplus production and avoiding food waste and there is an existing community garden and another in formation. “Self-sufficiency is a myth”, John tells the breakout group, proposing instead what amounts to a community-based self-reliance. “The question is this: What do you do with garden surplus? Where do you buy local food?. “The Blue Mountains has two local markets at which you can swap, sell or give away your excess produce. Some locals sell home-grown lettuce, parsley and other produce to local cafes and the Blue Mountains Food Co-op accepts local produce. What we need is the ‘law of large numbers’… lots of gardens producing a surplus and and connecting people locally. This would be the start of a local food economy”. And John has an idea for doing this through an Internet-based food swap based on a simple postcode search to locate local opportunities for exchanging food. Liz Bastian, a well known Blue Mountains permaculture designer and community activist, supported John by saying that seed, vegetable and food swaps occur monthly. Speaking of food advocacy, Jeanette Longfield suggests that advocates avoid adopting the terminology of those that oppose them because this merely validates the core of their opponents’ argument. Instead, she suggests reframing the issue in terms that enhance the argument of food advocates. reference to some ‘future disaster’ raises the idea ‘it’s ok now, at present’ and is unlikely to stimulate action. Jeanette suggests finding more acceptable, more appealing terms such as replacing ‘healthy’ with ’tasty’ or ‘good’ when it comes to describing the type of foods advocates are proposing. “Use powerful imagery” in advocating a sustainable and fair food system, Jeanette advises. Day two of the SFFA’s Hungry For Change Food Summit saw participants go in different directions. While some stayed at the conference venue to craft the Declaration on Food, others went on bus tours to the Sydney foodlands of the north west and the south west where they visited urban fringe farmers. Another tour voyaged through the inner city and out to the ends of the Eastern Suburbs to visit urban food initiatives, including community gardens, the Phillip Bay market garden in Randwick and an apartment block in Maroubra that has turned its front lawn into a vegetable garden. Hungry For Change was the culmination of months of planning and the hard work of SFFA members, especially Liz Millen and Catriona McMillan. More than this, it was the culmination of the drive for a secure and tasty food future by the nearly seven hundred who attended the regional food lead-up events and those at the Hungry For Change Food Summit. In handing the Declaration on Food to the politicians at Parliament House, Catriona handed on those hopes and desires, those ideas and demands articulated by all who attended the Hungry For Change events, as well as the others who could not attend the lead up and Summit event but who support its ideas, demands and initiatives. I read with interest your comments on food issues,we at glovers Garden,located in Rozelle Hospital are trying to keep our community garden of 25 years to continue growing organic food. Originally we had verbal permission to garden but with the State Goverment transfering control from dept of Health to Leichhardt Council We are amassing information on the history of the Garden to present to the council.if anyone could assist us with this it would be appreciated. My husband and I stumbled on your website and thought it was to be informative. My wife and I appreciated the blog and I look forward to viewing more from this blog very soon. How can I know when there is more blogs that are published here on this blog? I understand that the orange button at the top of the pages is a means of being notified of new material.